KUWAIT: The Interior Ministry’s Residency Affairs Department will use a unified form for all residency transactions starting from Feb 12 to help facilitate the process of verifying data and avoiding mistakes, Director Major General Talal Maarafi said in a statement. 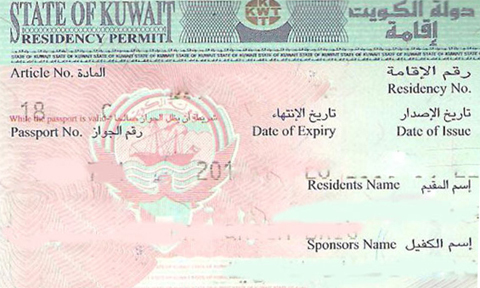 The form can be found on the ministry’s website at www.moi.gov.kw. The new service comes as part of the department’s efforts to develop its systems and facilitate procedures followed in all its transactions, Maarafi explained. In other news, the ministry’s Relations and Security Media Department warned that severe penal measures will be taken against any expatriate who violates Kuwaiti laws that bars taking part in any gatherings such as protests and ceremonial parades. Similar practices which take place following sports matches for example cause traffic jams and might include indecent practices, therefore a foreigner who participates in them would be punished by deportation, the ministry warned in a statement. A forensic medical report found no evidence of foul play in the death of a person who was seen in video footage that recently went viral on social media being carried into his house. Police had investigated the video and discovered that the man who was being transported was dead. They arrested three persons who appeared in the video carrying the man, but later released them when the autopsy report came to show no evidence of homicide. The report showed that the man had died due to a stroke, and also showed that his blood contained alcohol traces. A fire broke out in a fifth floor apartment in Salmiya, said security sources, noting that firemen rushed to the scene and managed to control the fire that started in the kitchen. The building was evacuated and no casualties were reported. A 35-year-old Indian was found hanging dead in a room annexed to his sponsor’s house in Waha, said security sources, noting that initial forensic reports suggest that the man committed suicide. In a similar case, a Nepalese man was found hanging dead inside the dormitory of a company that employed him in Sabhan, the sources said, noting that the man’s colleague told police that he was going through some financial problems.